In today’s Quick Microgrid News, Navigant identifies the market for community resilience microgrids…ABB and Samsung strike a deal to develop microgrids…SunEdison places a big order with Imergy…The Burns Group microgrid project at Temple University wins an engineering award…The Clean Coalition wins a microgrid consultanting deal with PSEG. A new Navigant Research report forecasts that the community resilience microgrid market will grow from $162.9 million in 2015 to $1.4 billion by 2024. The report looks at recent programs and projects in communities that are specifically linked to the idea of resilience, keeping the power on following storms and other disasters. 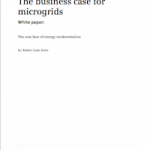 At the same time, it acknowledges that some microgrids may simultaneously serve other purposes, such as integrating renewables or improving economics. Community resilience microgrids differ from other microgrid segments primarily in that government is stimulating their development and providing funding and regulatory support. Such support is often necessary, Navigant Research said, because community resilience microgrids are plowing new ground with customers and utilities. Key players in the space named in the report are: Consolidated Edison, Exelon, Green Mountain Power, Hawaiian Electric, San Diego Gas & Electric, Eaton, GE Digital Energy, Schneider Electric, Siemens, Anbaric Transmission, Advanced Microgrid Solutions, Dynapower, Green Energy Corporation, Leidos, PowerSecure, Software Pioneers, OSIsoft, Spirae and Viridity Energy. The full report is available from Navigant Research for a fee. A free executive summary is here. ABB and Samsung SDI have signed an agreement to establish a strategic commercial alliance to develop and market microgrid systems that include energy storage. The two companies plan to globally market modular and scalable microgrids that use lithium-ion batteries for energy storage. The deal leverages ABB’s global presence and knowledge in microgrids to bring Samsung SDI into the microgrid market. Meanwhile, Samsung offers ABB know-how and help with batteries and energy storage. Japanese market research firm B3 named Samsung SDI as the the world’s largest lithium-ion battery manufacturer in 2014 for consumer electronics and stationary applications. 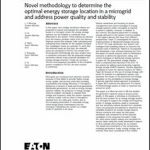 Navigant Research forecasted last year that the energy storage market for lithium-ion batteries in microgrids will reach 3.42 GWh by 2022, a 41 percent growth rate. SunEdison has purchased 1,000 energy storage systems from Imergy Power Systems for its rural India projects. The order of vanadium flow batteries amounts to over 100 MWh. The batteries will be used to store solar power for SunEdison’s rural electrification and minigrid projects. SunEdison also will increase its equity investment in Imergy. This strengthens the supply relationship between the two companies as SunEdison begins deployment of its extensive rural electrification program in India. SunEdison has a goal to help 20 million people by 2020 gain access to electricity. The Temple University microgrid, a project of the Burns Group, won a diamond award from the American Council of Engineering Companies (ACEC) Pennsylvania for engineering excellence in the energy category. The award was given for innovation and originality, social and economic considerations, complexity, future value to the engineering professional, and success in meeting client goals. Burns provided engineering, design and construction for the modernization of the electrical infrastructure at Temple’s main campus in Philadelphia. The campus-wide, three-year, $15 million program extended to every corner of the 105-acre urban campus. The Clean Coalition will provide consulting services to the Public Service Enterprise Group for community microgrid and energy storage projects on Long Island. The California non-profit, known for its work at Hunter’s Point, was selected from a competitive solicitation. The projects will be designed to use cost-effective energy storage to scale local renewable energy and enhance power quality, grid reliability, and resilience in the East End of the South Fork, an area particularly vulnerable to storms. Track microgrid news by subscribing to our newsletter, Microgrid Knowledge. It’s free.